I am new to DDS. I installed rti_connext_dds_secure-5.3.1-eval-x64Win64VS2010 on my desktop with Windows 7 64-bit computer with Visual C++ 2017. When I follow the instructions in "https://community.rti.com/static/documentation/connext-dds/5.3.1/doc/manuals/connext_dds/html_files/RTI_ConnextDDS_CoreLibraries_GettingStarted/index.htm#GettingStarted/BuildingRunningHelloWorld_.htm", opened the solution file "HelloWorld-x64Win64VS2010" and tried to build it within Visual Studio 2017 but failed. The output is listed as follows. It may be an easy fix, but I don't know how. Can somebody please help? Thank you. 1>c:\users\quan\documents\rti_workspace\5.3.1\examples\connext_dds\c++\hello_world\src\helloworld_publisher.cxx(186): warning C4996: 'sprintf': This function or variable may be unsafe. Consider using sprintf_s instead. To disable deprecation, use _CRT_SECURE_NO_WARNINGS. See online help for details. 1>Done building project "HelloWorld_publisher-x64Win64VS2010.vcxproj" -- FAILED. 2>Done building project "HelloWorld_subscriber-x64Win64VS2010.vcxproj" -- FAILED. As a quick experiment, try doing a "Retarget Solution". This can be done by right-clicking on the VS17 solution and selecting "Retarget Solution". I tried it. 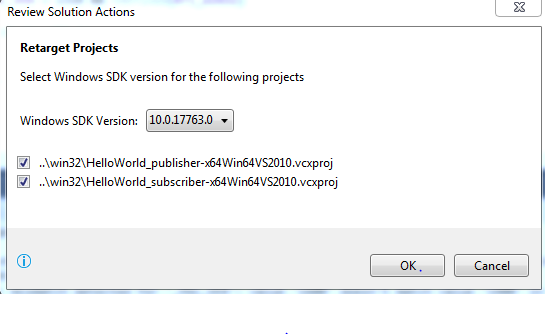 It shows my Windows SDK version of 10.0.17763.0. After I clicked OK, still the same link errors though. There's a mismatch between the libraries that you installed (and the projects you generated), which used Visual Studio 2010, and your Visual Studio version, which is 2017. We have available an evaluation version of RTI Connext DDS Secure for VS 2017 that comes in a different package called rti_connext_dds_secure-5.3.1-eval-i86Win32VS2017.zip. Could you try to download and install that version? That should hopefully fix the mismatch. I've downloaded and installed the new software rti_connext_dds_secure-5.3.1-eval-x64Win64VS2017 and the Hello_World example finally worked. The download shows this is for Windows 10, and my computer is Windows 7 and it seems to work (at least) for this example. When I first built the project, it complained it cannot find some library. Checked the Linker found the "Additional Library Directories" is "$(NDDSHOME)\lib\x64Win64VS2010". Changed that to "$(NDDSHOME)\lib\x64Win64VS2017", and everything worked.